On October 27, 2010 at Chateau Marmont in Los Angeles,California.Hollywood Supper stars show their support for amfAR at a gala evening sponsored by Piaget.The gala evening hosted by Grammy award winner,Kylie Minogue,superstar Sharon Stone and fashion designer and amfAR board member Kenneth Cole. Piaget’s jewellery and watches are the ccessories of choice for the star-studded affair.usician, actress and fashion muse, Courtney Love, wore a dazzling diamond and white gold Piaget Polo and treated guests to an acoustic performance of Madonna’s “Like A Prayer” and Lady Gaga’s “Bad Romance.” Ali Larter,star of Resident Evil:The Afterlife and hit TV show Hero’s and soon-to-be mom, glowed in Piaget’s new Possession double hoop diamond earrings,the newest Possession Celebration ring and Piaget’s Honey inspiration necklace.Mía Maestro,rumored to be the star in the upcoming Twilight: Breaking Dawn film,wore Piaget’s white gold and diamond Rose motif earrings and a matching ring. 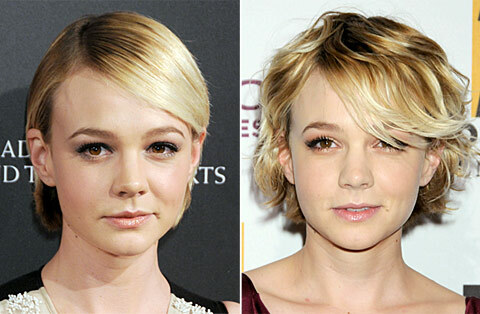 Carey Mulligan has been wowing us with her grown-out boy cut on the premiere circuit for Wall Street and Never Let me Go. She’s been wearing the choppy crop with a lot of texture, but at last night’s BAFTA Britannia Awards in L.A., she worked some hot-styling magic for an ultra-sleek, side-parted coif. It’s amazing what a good blow-out can do. Which do you prefer: wild and wavy or straight and narrow? MODEL and entrepreneur Summer Rayne launched her new enterprise – Source4Style design portal – at Next Models headquarters with Tyrone Wood, former Burberry star Emily Hope and Chanel muse Ella Kandyba. “It’s all going so well,” Rayne told us last night. “I haven’t stopped talking all night – it’s a great turn out.” Her idea, Source4Style, is a website that makes it easy for designers to use materials that are ethical and environmentally-friendly through a simple search-and-source facility. Organic canapés came via Jo Wood’s catering company, Mrs Paisley’s Lashings, and included mixed seafood ceviche, spicy crab with dried mango and chili on toast and wild mushroom rarebit – washed down with organic mojitos and mangosteen cocktails. MARY KATRANTZOU was last night named the winner of this year’s Swiss Textiles Award. The Greek-born designer – whose stunning spring/summer 2011 interior-inspired collection was the talk of London Fashion Week – beat off stiff competition from fellow designers Jason Wu, Duro Olowu, Adam Kimmel, Juun J and Damir Doma. “I’m stunned. It was such a big build up and I cried backstage so I think that says it all,” said a thrilled Katrantzou who collected her award – which she told us would take pride of place in her new studio – from last year’s winner, Alexander Wang. Katrantzou now pockets €100,000 in prize money – €10,000 of which will be used to purchase Swiss textiles. “The financial support is amazing at a stage when the business is growing and it’s so important to have that support. It’s a very prestigious award, it’s a benchmark and a great honour,” said Katrantzou. So what else, if anything else, has she been up to while in Zurich? And what about the next collection? “I hate the crazy women—you know the ones at samples sales,” Rebecca Minkoff said. “If it’s a sale in a civilized environment, then I will go.” And despite the lure of a discounted Vena Cava wool cape or a Nicholas K leather jacket, shoppers at Lucky’s Lucky Shops VIP preview last night remained relatively calm. (Though one of the busiest boutiques was Minkoff’s own, where ladies were getting pretty animated about studded leather satchels.) A crew of browsers, including Hilary Duff and Nate Berkus (pictured), Michelle Trachtenberg, and Twiggy browsed the heavily-discounted racks, some with more urgent shopping missions than others. Duff picked up a few pieces from the sister-act jewelry line Dannijo, but what she really needed was something a little warmer than the Diane von Furstenberg L.B.D. she was wearing. “I didn’t bring a coat to New York this time, which was stupid because I am freezing,” she admitted. Then off to outerwear she went. WHILE he might not have scooped last night’s Swiss Textiles Award, Jason Wu didn’t walk away empty-handed. “It’s been really nice meeting the other designers like Duro [Olowu] and Adam [Kimmel]. In New York you don’t meet so many other designers and it’s really interesting finding out about their different backgrounds. It’s like a camaraderie – going through things together,” said Wu backstage after the awards, where he showcased his spring/summer 2011 collection – one which he described as being his “most ambitious yet”. “When you’re working on your collection you have to be in your own world, it’s really nice to get out – see other people’s work. It’s really valuable,” the designer told us. Stefanie Graf is one of the brightest stars of ambassadors in the Longines family.She started playing at the age of four and quickly rose to join the top-ranking players.She was always admired for her professionalism as well as her courage and has gone down as one of the leading names in the annals of tennis. Stefanie Graf’s tennis career lasted 17 years.The list of her achievements is really impressive–actually the lady won every possible title in the discipline: 902 victories, with 22 Grand Slams and an Olympic medal on the list. Stefanie held the title of no.1 in the WTA ranking for 377 weeks–this record has not been surpassed to this day.Stefanie Graf was indeed a superlative player! Last January, Gossip Girl actress Blake Lively raised a few eyebrows when she wore a pair of perforated faux-leather Stella McCartney thigh high boots under a crisp white blouse and a black blazer to a New York city red carpet event. Blake looked blazing hot in the skintight boots, which served as a saucy substitute for pants (they’ve had a bad year, pants). On Wednesday, pop icon Madonna wore the very same boots beneath an eyecatching semi-sheer sequined dress to present an award to Iconix Brand CEO Neil Cole at New York City’s Waldorf Astoria. She complemented the look with loose blond curls, glittering hoop earrings and her beloved Kabbalah bracelet. Which booted beauty better rocked these Stellas? MULBERRY invited a select group of its friends including Eliza Doolittle, Anoushka Beckwith, Edie Campbell, Mary Charteris, Cara Delevingne, Clara Paget, Tallulah Ormsby Gore, Ben Grimes, Bonnie Wright and Tali Lennox for dinner at Morton’s in Mayfair last night to preview the spring/summer 2011 collection. The dining room was made-over in line with Mulberry’s Grey Gardens-inspired range, with huge neon roses peeking in from outside the windows and goodie bags featuring lookbooks, vouchers for the soon-to-be-opened New Bond Street store and Kiehl’s products were waiting for guests on their chairs. After the dinner of risotto, sea bass and poached pears, guests were invited downstairs to the Night Lounge for cocktails and dancing.